Jump In our very own monthly newsletter will be hitting your Email inbox just very shortly so keep your eyes peeled for it. A sneak preview here as always. Yes we know that so many of you don’t want to hear the word Christmas – not already, but with mainstream shops like John Lewis already launching their Christmas TV advert (isn’t it fantastic by the way?) We just love their Man on the Moon advert – if you’re looking for a new marketing agency John Lewis, we could be persuaded! So, if any of our other clients are turning their minds to their festive communications, please feel free to drop us a line – we’ve got a few little elves that would be able to work some magic for you! As part of an ongoing campaign Abyss were asked to design a new on bus cove vinyl for our friends at First Essex Buses. The cove specifically encourages customers to feedback to the company about the cleanliness of the bus fleet in Essex. With winter now upon us it’s a never ending job trying to keep buses clean and tidy with the onslaught of bad weather so good luck to First Essex with this initiative. Service 100 gets a new look! 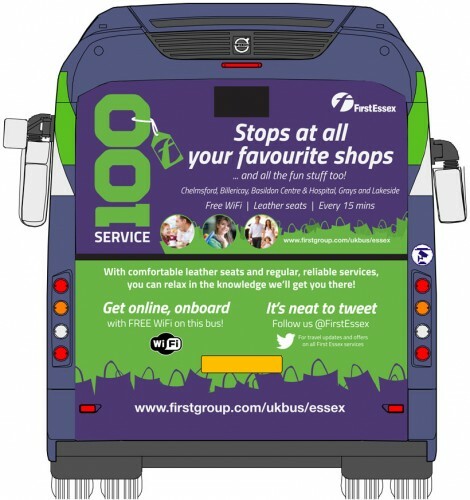 Whilst supporting First Essex recently, Abyss Marketing was asked to develop a new suite of on bus materials for their Service 100 that runs from Chelmsford to Lakeside via Basildon. We created some fantastic new materials including mega bus rears, on bus cove vinyls, drivers cab welcome vinyl and a new leaflet for Service 100. Our Account Director, Paula Middleton, said a sad farewell to First Essex Buses last week when her 3 month marketing support contract finally came to an end. It was a busy 3 month period and involved lots of hands on support and lots of travelling up and down to Chelmsford. However, it’s not all sad news as Abyss Marketing continue to give support and work with the team at First Essex on a number of marketing initiatives going forward. Alex Jones, Managing Director of First Essex Buses added; “Paula has been a fantastic asset from start to finish since working with us at First Essex Buses Ltd. Her wealth of experience, tireless enthusiasm and knowledge enabled a seamless process when producing marketing campaigns to the highest standard and provided valuable support. No job was too small or too big. Paula always delivers on time with robust drive and with a joyous attitude that is contagious throughout the business. Just some of the work we’ve created for First Essex will be available to view via our website and twitter account shortly. October Jump In is spooky! The latest issue of Jump In, our monthly newsletter will be hitting your inboxes very soon. Lots of stories about our recent antics and of course as it’s approaching Halloween, it’s got a special spooky theme to it! Young people across the city are being challenged to showcase their photography skills for a cash prize. In a bid to drive creativity, the new Blooming Big Aberdeen photo competition invites 16-25 year olds to capture inspiration through images of the city and through interaction between generations. The competition, run by ACVO, the third sector interface for Aberdeen City, aims to encourage self-expression and engagement – with the winner receiving a cash prize of £1,000 at an exhibition of finalists in summer 2016. “We will welcome entries from students, from young people supported by charities and from the staff and customers of local businesses. The competition is one of a series of upcoming events created as a result of the Big Aberdeen event which took place in September 2014. 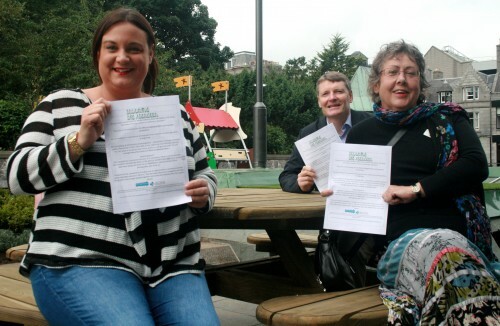 Big Aberdeen is a collaborative effort between cultural, public, private and third sector organisations in an attempt to encourage a joined-up approach to the city. Entry forms are now available from the ACVO website and an expert judging panel from the worlds of photography, marketing, volunteering and environmental service will meet to consider entries. Paula Middleton, Account Director for Abyss Marketing, said: “Being a local agency with strong ties to Aberdeen and the surrounding area, we are absolutely delighted to be involved in this very worthy and somewhat unusual project. We’ve done a lot of work with Farsley Constitutional Club over the past 12 months and that work continues. We’re currently helping the club rebrand to encourage more local community activity. Through local research, we’ve established that the function room at the Constitutional Club was in fact a renowned dance school run by the late Mr and Mrs Porritt. 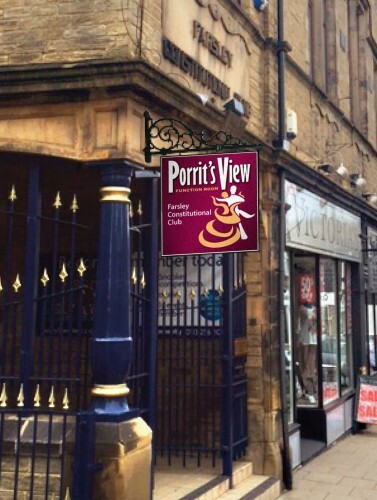 We managed to source a rather apt quote from one of the local residents in the village of Farsley which in turn was the inspiration for the clubs function room being renamed Porritts View. At Abyss we excel when it comes to helping small, local businesses and charities. We’ve done lots of this in the past and we’re only too happy to continue giving our support where it’s needed. 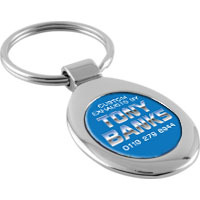 That was the case when exhaust specialist Tony Banks booked an event for the VW Dubbers (VW enthusiasts club), they needed some relevant merchandise to promote their services. Tony Banks offers a 5% discount for all VW Dubber members who want to ‘zoop’ up their VW’s with a new exhaust system. We were only too happy to design and produce the merchandise to support their event.